Description Join The Lawrence on Wednesday, Sept. 7 around 10 p.m. for a one-of-a-kind event, when the Midtown restaurant is taken over and transformed for a post-dinner cabaret show. 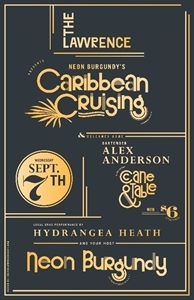 We’re welcoming Neon Burgundy’s Caribbean Cruising drag show and New Orleans’ Cane & Table’s bartender Alex Anderson, a former Lawrence mixologist. The free, after-dinner show will feature a local drag performance by Hydrangea Heath and fantastic cocktails, including $6 specials, from Anderson all night! Add Caribbean Cruising at The Lawrence to your free online travel itinerary.